It is a lazy Sunday morning with Husband and kids at home. 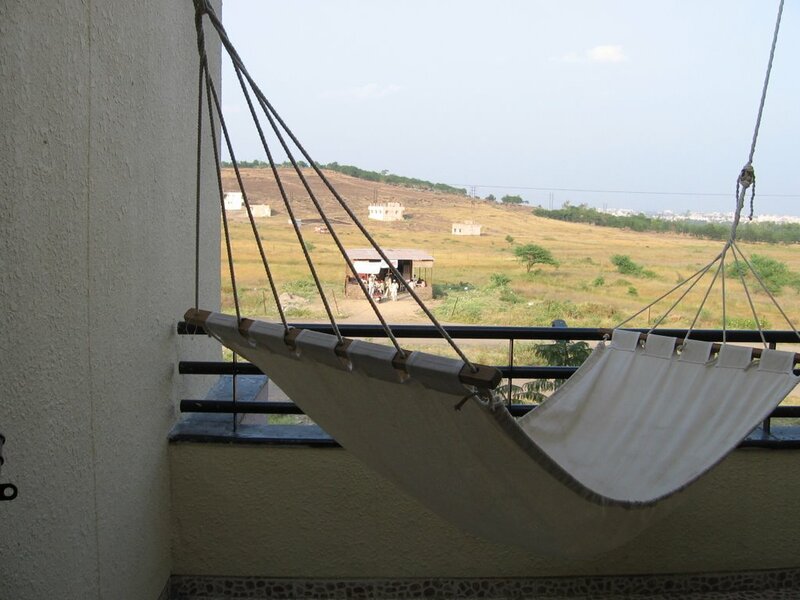 Feel like just lying in my hammock (yes,that is my hammock in the picture you see.I love looking at those hills) and watching the world go by. But there is so much to do. There is the book sale that I want to go to. There is my book shelf which is overflowing with books, which I have been meaning to rearrange. The kids studies have to be supervised. (Monday morning blues are already setting in).As usual, any homework that has to be turned in has a magical way of reappearing only when there are 3 minutes left to board the school bus! Today I plan to pre-empt that. School books shall be thoroughly checked, and a third degree interrogation shall be carried out to extract any information about verbally told assignments! (Usually these are the ones that are conveniently forgotten! )I am in a super-mummy mode today. How is it that kids do not pester their fathers? How do fathers get all the time in the world? Why are dads never interrupted when they read their newspaper? How come dads get to watch their NBA and ESPN and a million other things on T.V without once getting disturbed by the kids? Or does this happen only to me? I can hear my hammock calling me, but it will have to wait. What is it about kids and homework?..I've been on to my middle son today who is 11. He so reluctant to do his homework..but if we don't push him, then as you say..he'll reveal it tommorow morning just prior to leaving for school..and blame ME for not reminding him!! P.S Thanks for the kind comments regarding my Artwork! Hay how are you... looks like you live in great part of the world, All i can see out of my window is houses. But i like it. 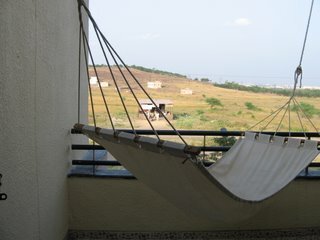 Thanks for you nice comments, Love your Blog too..
Lovely Hammock....and the view is so relaxing....a perfect place to write a poem...or pour your heart out...!!!! Was reading your old posts today morning while travelling....felt so nice....!!!! !